Philip Meyer took a series of photographs showing residents of the Blue River Valley as they prepared to move from their homes and farms as part of the Tuttle Creek reservoir and dam relocation project in Pottawatomie County, Kansas. He captioned this photograph "for Mrs. Eileen Willingham of Englewood, California (front row, second from right) this may be the last visit to the church she attended as a child. Many members of this congregation are descendants of Marie Johnson for whom the church was named." This is probably Mahridal Lutheran Church, organized in 1863. 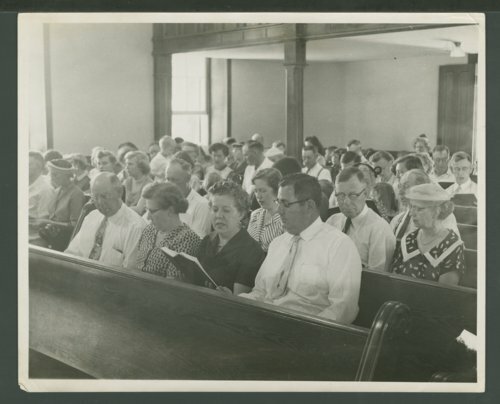 The congregation is shown in this photograph.